Understanding, and ameliorating, the causes of global bee declines has important consequences for the pollination of food crops and wild flowers. Our reliance on agricultural chemicals (e.g. pesticides) to boost crop quality and yield is one environmental stressor that could have a significant detrimental impact on both wild and managed bees. Many insecticides act by disrupting the normal flow of information through the insect nervous system, so even when applied at levels that are not fatal they could still affect behaviour. Such sublethal behavioural effects can happen in beneficial insects (e.g. pollinators) as well as insect pests. Furthermore, widespread agricultural intensification means that bees are exposed to numerous pesticides when foraging. In my lab we aim to answer questions such as how is field relevant exposure to pesticides affecting the behaviour of individual bees and therefore (in social species) colony function? How do the impacts of multiple environmental stress factors interact (for example, exposure to multiple pesticides, or pesticides and pathogens)? How might pesticide exposure affect pollination services to crops and wild flowers? Raine and his team has made major advancements in our understanding of how essential pollinators are affected by environmental stress, including toxic impacts of pesticides and their interactions with parasites. This research on the impacts of environmental stressors, emerged from his extensive studies of individual and colony level variation in bee behaviour. Raine’s work has been at the forefront of the recent surge of research interest in pesticide impacts on bees, and particularly highlights the importance of sublethal impacts on the behaviour of individual bees and how these can have significant knock-on effects on both colony function and population traits. Indeed, Raine and his team were the first in the world to conduct experiments to measure the sublethal effects of combined exposure to multiple insecticides at field-realistic levels on bee behaviour and colony function (Gill, Ramos-Rodriguez & Raine. 2012. Nature 491: 105-8). Results of this work have received considerable attention from regulators and policy makers around the world, and over 350 citations from the scientific community to date. Raine and his team were also the first in the world to demonstrate that exposure to field-realistic levels of neonicotinoid insecticides can lead to measurable reductions in the pollination services provided by bees to economically important crops. 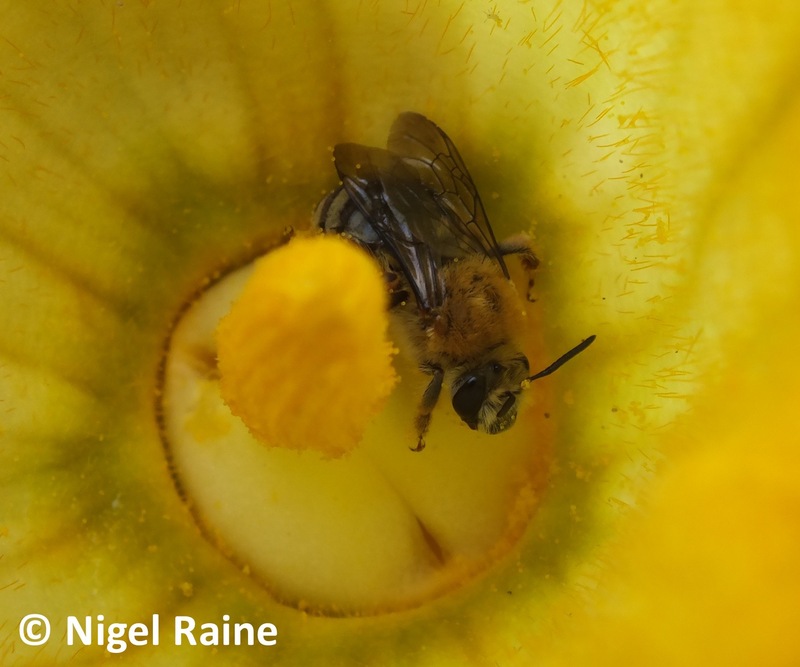 Changes measured in learning and foraging behaviour lead to both reduced collection of pollen from apple flowers and also less effective transfer of pollen between varieties. These results are the first to show economic impacts for farmers of unintended consequences of insecticide exposure on pollinators (Stanley et al. 2015. Nature 528: 548-50). I am interested in how (or indeed if) the cognitive abilities of animals are adapted to their environment. The fact that individuals within a population can differ widely in their cognitive capacities despite apparently operating in the same environment has lead me to examine the costs and benefits of this behavioural variation. I use bumblebees as my model system as they face complex cognitive tasks everyday when making foraging decisions about which flowers to visit in nature’s dynamic pollination market. Despite their small brains, bees rely heavily on learning and memory to select the most profitable flower species and patches, and also to navigate in complex landscapes. Raine and his team have explored variation among individuals, colonies and populations to investigate the adaptive value of variation in innate preferences, learning and memory performance in a range of environmental conditions. His results, combining laboratory learning assays and field assessments of foraging performance, reveal that colonies containing faster learning bees are considerably more efficient at collecting food from flowers, a key limiting factor for colony reproduction (Raine & Chittka. 2008. Proc. Roy. Soc. B 275: 803-8). Individual workers from the same colony also vary appreciably in their learning performance across a range of tasks, probably reflecting the need to deal with unpredictable foraging conditions (Raine & Chittka. 2012. PLoS One 7: e45096). Raine’s pioneering findings have significantly influenced research in this dynamic research field of cognitive ecology traditionally dominated by studies of vertebrates. Raine and his team have also made significant contributions to our understanding of how pollinators move in the landscape. In addition to having significant impacts on their efficacy as pollinators of crops and wild flowers, understanding bee movement patterns has allowed him to study how simple computational systems (bee-brains) can solve complex, dynamic routing problems. 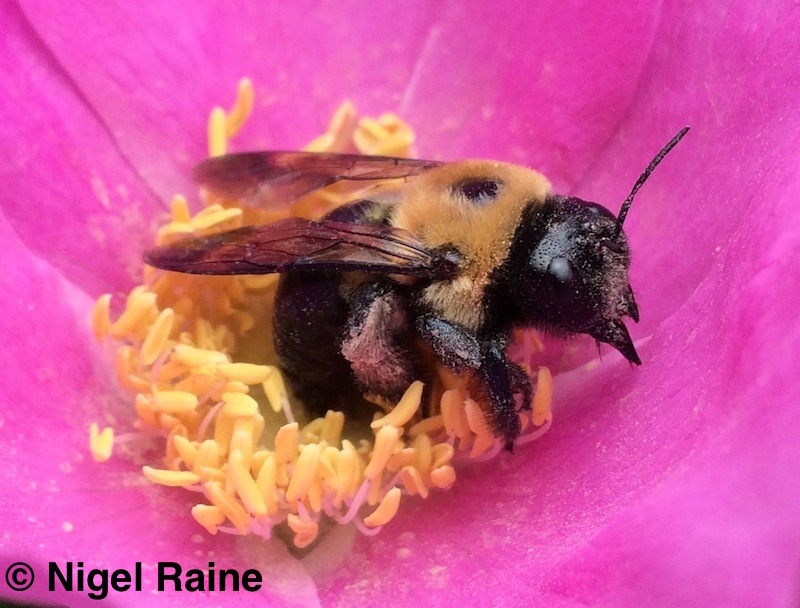 Raine’s research has elucidated the decision rules and strategies bees use to find the shortest route between flower patches, thereby minimizing energy expenditure on foraging trips. Using innovative technologies, including computer-controlled refilling flowers, motion-sensitive video cameras and harmonic radar tracking, he has established how bees explore their environment for flowers, establish efficient foraging routes and respond to changes in food availability (Lihoreau, Raine et al. 2012. PLoS Biology 10: e1001392). Raine’s theoretical and empirical approaches to understanding how simple decision rules can create and maintain efficient routes through networks have translational relevance for intelligent management schemes for road traffic systems, information webs or logistics networks.